Myles Kennedy really came to prominence as the lead-singer of Alter Bridge, following the initial demise of the multi-million selling Creed in 2003. His first band, The Mayfield Four released two critically acclaimed albums and were the perfect showcase for Kennedy's vocal and guitar skills and it was as part of this band that he came to the attention of guitarist Mark Tremonti, who was looking to put a new project together alongside his former Creed cohorts Scott Phillips (drums) and Brian Marshall (bass). Alter Bridge have now released five albums and for the best part of 10 years Kennedy has also been the lead singer for Slash's recording and touring band. After almost 2 decades Kennedy has finally released his first solo album, 'The Year Of The Tiger' and taken the touring plunge as a solo artist to promote its release. Kennedy never does press during tours (to save his voice), so Fireworks caught up with him as he prepared to return to the UK for a series of intimate performances and festival appearances. He was in a very relaxed mood and keen to discuss his newfound solo success and the need to make the album. It was something I really had to do and I didn't have any real expectations about how it might be received. It was such a different approach for me musically, different to the sound that I have established with Alter Bridge and the albums I've done with Slash. Speaking now, several months after its release, it's obvious that people have embraced it way more than I dreamed they would. It was a wholly cathartic experience and it was only after the record was completed that I looked back and fully understood just how much it had meant to me. I had jumped in head first to write and create something very personal and as I got deeper and deeper into the process it was then that I realised just how challenging and cathartic it was. I was re-opening a bottle and re-igniting a whole bunch of feelings. I was so glad that I got the opportunity to do it and I really do feel it was the best therapy I could have asked for. Not only did I get to make a record I really wanted to, but the icing on the cake is that it is really resonating with so many people. Listening to the album from start to finish is something of an emotional journey and the concept nature of the material would be the basis for a great show on its own. Myles has been varying the set list from night to night and the performances are generally completely acoustic, but the door is always open to plunder 'Year Of The Dragon' for all 12 songs at some point. I did think of performing the album in its entirety and I'm hoping to do that at some point during the next few weeks. I've been playing 5 or 6 of the tracks, but when I do eventually go out with a band it's my intention to do all 12. We'll just have to see whether they are in sequence or not. I've got Zia Uddin on drums and Tim Tournier on bass. Both these guys play on the record and Zia was also the drummer back in the old Mayfield Four days. As an integral part of both Alter Bridge and the Slash line-up there is very little room to dedicate great amounts of time to a solo career, but Myles is keen to build on the success of '....Tiger' and the current run of shows. I definitely think I have the bug. It has proved to be such a musically rewarding experience and it has certainly helped me grow and develop as both a writer and a person. It has helped me discover such a lot about myself and that is something very important to me. It was great going back to the old Mayfield Four stuff and it made me realise just how different a place I was in when it came to writing lyrics. I was a younger frustrated man in his 20s (laughing) and I was drawing on a whole bunch of relationship dramas as the inspiration for the subject matter of the songs. Obviously I'm proud of the songs and it's a blast to include the likes of 'Eden', 'Mars Hotel' and 'White Flag' in the set now. The schedules with Alter Bridge and Slash do include lots of touring on the back of records, but I'm confident they will allow for more solo stuff. These are kind of good problems to have. 'Watch Over You' has been a solo spot for Myles for many years now, as part of an Alter Bridge show, but going out in front of a crowd knowing you are the sole focus for everyone's attention for 90 minutes must have initially proved to be intimidating? There is also the issue of knowing which songs would work and which wouldn't suit the acoustic format. There were a certain amount of nerves, especially when I was rehearsing and putting the shows together. I had about 6 weeks at home before I first went out on tour and I spent that time just playing different songs to see which worked and which didn't, trying to figure how some of the arrangements would need to be tweaked. Until I actually got out there and played I had no idea just how some of them would go down. The first show I did was in South Africa and was in front of more than 2,000 people. It was a bigger venue than many I've been playing. Standing at the side of the stage getting ready to go out there I was feeling surprisingly good considering what was about to happen. I guess I got all the nerves out of the way before the shows began and then the adrenalin kicked in. From then on it all felt very natural. Almost like one of the old 'VH1 Storytellers' shows? I think that's a good comparison. There needs to be a personal connection during the shows. In an acoustic environment there has to be a strong relationship with the audience. The fans have been so wonderful during this whole process and the fun banter never gets out of hand. Obviously my association is with loud rock bands, so this is a brand new format for me, a new approach. I was under no illusion about how the crowds would react to just me on stage with an acoustic guitar. I went into the whole thing knowing I had to do it from an artistic standpoint, but having no idea whether anyone else would be on board for it. A few people have mentioned that the shows would make a good live record and I think we might look at doing that somewhere down the line. Following the upcoming solo dates the focus for the immediate future will be with Slash. It's not Guns n Roses, it's not Velvet Revolver and it's not Alter Bridge, but Myles seems to have developed a healthy working relationship with the guitarist and both have adapted to each other's writing styles over the course of the last 10 years or so. Working with Slash varies from the way I work with Mark (Tremonti) when writing for Alter Bridge. I guess the Alter Bridge stuff has something of a Progressive edge to it and Mark and I will both bring musical ideas to the table and fuse them together. Generally when I'm working with Slash he comes up with most of the riffs and chord progressions, then I'll put the melody and the lyric over the top of it. Occasionally if I see a way to arrange something differently he's cool with it. He's very aware that we are trying to do what is best for the song. We pass the ideas back and forth electronically, but we do sometimes sit down together as a band to work on arrangements. After a decade or so you could call it a science. The new record is done and will be released some time later this year. We are just trying to put the tour together and that will be my main focus, but I'll still be looking to put together some more solo shows as well. Myles is busier than ever. Alter Bridge get together every 3 years to write, record and tour and the gig with Slash and the Conspirators seems to work to a similar timeframe. With a successful solo career now up and running it must be difficult to find time to relax. I'm trying to learn how to relax (laughing). Over the course of the last 7 or 8 months I've discovered the art of meditation, which has been extremely helpful. I think what I love to do is create music and that's what makes me happiest. It's work to a point, but so much fun, so how can I have any complaints? The interview degenerates slightly when Myles is asked about his long term plans and whether there is anything he like to do alongside AB, Slash and his solo ventures. How about a Black Metal Polka record? (Lots of laughing). There's something about an accordion going through a 100 watt Marshall amp! 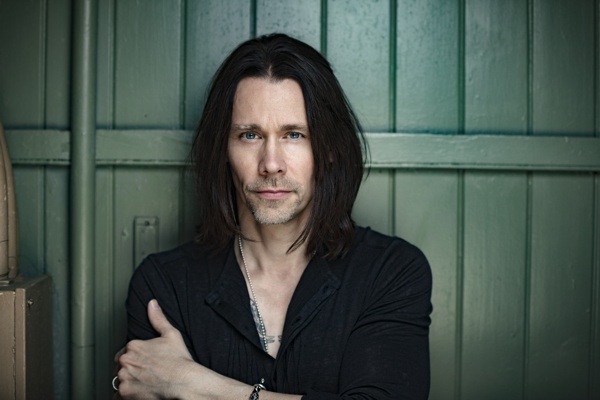 At the time of the interview (June 27th) Myles is just 10 days away from playing a show in Liverpool for the very first time (see Rocktopia website for review). We wind up by discussing how tour schedules are arranged and the opportunities to check out the cities before or after the performance. I don't really get involved with the arranging of the schedules, I trust the judgement of my booking agent and management. I'm excited to be coming to Liverpool for the first time and I've been driving my wife mad lately playing the 'Sgt Pepper' and 'Abbey Road' records. Occasionally there is time to check out the city where we're playing, it generally depends on the location from the night before.